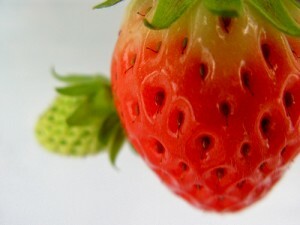 Our region is a prime area for growing and enjoying delicious and nutritious berries. They are available as U-Pick produce at many local farms and flood our farmers markets each summer with their colorful bounty. They are also very easy to grow and harvest if you pay attention to their basic growing needs and know when to harvest for prime produce. Plant some berry plants and enjoy your summer! Give them 1-1.5 inches of water per week, especially during bloom until harvest and again in late August through early fall. Water the soil instead of the plants to prevent disease and mold from growing on fruit. Fertilize with an organic nitrogen fertilizer if leaves are yellow or pale green or plants are not producing new green growth. Ensure plants get enough food and water by weeding and mulching. Remove older plants every few years and nourish the new pups that grow on the runners (stolons) each summer. Pick your berries often to keep critters (slugs) and disease away and to enjoy them! Do best in full sun but can take a little shade. Need good drainage and about an inch a week of water. Drip irrigation will help prevent disease by keeping water off the leaves. Mulch will help keep down weeds and conserve moisture. Raspberries need support to hold the canes upright. Check with fruit growing resources to see how to set that up. Summer-bearing raspberries grow on canes (floricanes) that set fruit in the second year of growth then die. Prune out the canes that you harvested from and choose the new canes (primocanes) that are coming up for next year’s crop. You might need to thin! Berries will easily pull off the plug or receptacle when they are ripe and the plug will remain on the plant. Harvesting every 3-4 days will help prevent disease and keep away pests that like rotting fruit. The delicate berries are easily crushed, so put them in a container instead of a plastic or paper bag. Grow best in soil that is too acidic for many other plants. Need good drainage and 1 to 2 inches of water per week. Their shallow roots will become damaged if allowed to dry out. Fir sawdust or pine needle mulch will help conserve moisture. Top-dress under the wood mulch with compost. Do best in full sun but can tolerate partial shade. Expect a little less fruit in shade. They are generally self-pollinating, but planting more than one type of cultivar can increase berry size and production. Extend your harvest by planting cultivars that ripen at different times. You will see them labeled as early, mid and late season and you can choose within those categories. Make sure bloom times overlap to encourage cross pollination. It can take a few days to a week after they’ve turned blue for berries to become fully ripe, but it is worth the wait because they may get sweeter. For better shelf life, pick berries when they are firm and the scar (where the berry attaches to the stem) does not tear when picked. Plant enough to share with the birds! And cover the ones you want for yourself with netting! Blackberries grow on canes like raspberries whose plug or receptacle remains in the berry instead of on the plant when you pick them. Blackberries can be trailing, erect or semi-erect. ‘Marion’ is the one of the most widely planted trailing types in the Pacific NW. Many people shy away from growing blackberries because of the thorns. There are thorn-less cultivars that grow well in the Pacific Northwest. Like raspberries, blackberries need some type of support and annual pruning to leave room for the growth of new fruiting canes. Their floricanes can be tipped when abour 48 inches tall to maximize fruit production. When done bearing cut those canes out and nourish the primocanes coming up for next year’s crop. Himalayan blackberries, found in empty lots everywhere in the northwest, are considered invasive in the Pacific NW. They are also a favorite food of birds and human foragers. They do displace native vegetation and can increase rat habitat. Choose wisely and manage them well!